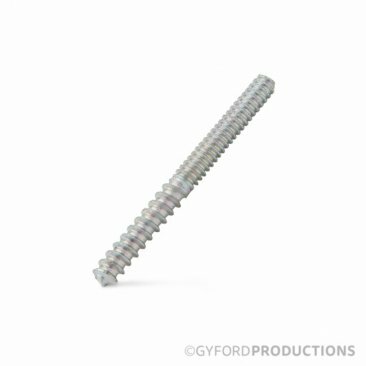 Wood Mount Hanger Screws allow sturdy and secure attachments of Gyford StandOff Systems components to wood surfaces and mounting points, like wall studs. One end has a thread for wood and the other end has machine thread for attaching our decorative hardware. They are available in multiple thread sizes and lengths. Please note Wood Mount Hanger Screws are threaded on both ends, so a threaded driver is necessary for installation. 3/4" thread length. 1-3/8" overall length.